Before the era of country clubs and long before the Civil Right's Revolution opened opportunities for women, there were exclusive clubs in most cities where powerful men met to discussion deals, finances and politics. In many places, the most prosperous of these clubs built impressive building, none more elegant than the Detroit Athletic Club on Madison in downtown Detroit. The Detroit Athletic Club was founded in 1887 to encourage amateur athletic activities and built a clubhouse with a tract in what is now Detroit's Cultural Center. Henry Joy, son of the man who built the Michigan Central into one of the nation's most successful large railroads, served as president of the Packard Motor Car Company in the early decades of the last century. Apparently he felt that the rich new titans of the booming automobile industry spent too much time in the Woodward Avenue pubs. He thought they needed a club commensurate with this stature. On January 4, 1913, Joy and 108 other leading Detroit citizens came together to reorient the Detroit Athletic Club. Joy and his colleagues selected Detroit's most accomplished architect, Albert Kahn. Kahn, in 1912, had visited Italy and was inspired by the buildings he saw there. Two of Detroit's most impressive current downtown edifices—the Detroit Athletic Club and the Police Department headquarters on Beaubien—reflect what Kahn saw in Italy. The Palazzo Borghese in Rome provided Kahn with a model for much of the Detroit Athletic Club but the idea of using the large impressive windows for the impressive fourth floor dining room—called the Grill Room—came from the Palazzo Farnese. In the 1990s, the membership devoted substantial fund to a major refurbishing of the attractive building. 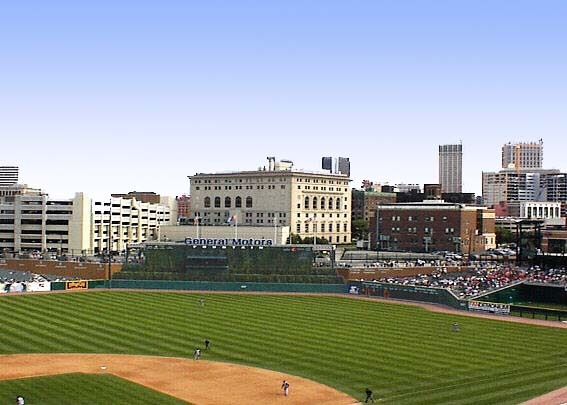 Please note the interesting location of the Detroit Athletic Club near the two new stadia that, many hope, will contribute to a revitalization of downtown Detroit in the 21st century. Use in 2002: There has been no change in the use of this impressive building. Book: Kenneth H. Voyles and John A. Bluth, The Detroit Athletic Club: 1887-2001, Chicago: Arcadia Publishing, 2001, Images of America Series. This Albert Kahn building is not listed on any historical register.